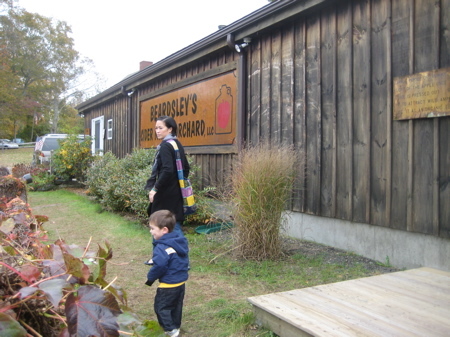 An October weekend in New England with a trip out to Beardsley’s Cider Mill (among other stops) for some refreshments and another item on the Roadfood “Eat Before you Die” list. But not just any item – a dessert item. Yes… Bliss. The Beardsley’s have been farming this plot of land in the White Hills of Shelton since 1849! It was a dairy farm until a school bus lost its brakes and crashed into the barn in 1973, burning it to the ground. Everything from hay to turkeys has been raised on the farm, including apples planted in the 1920’s which are still being harvested today. In an effort to provide the growing community with a fresh, local commodity, and to preserve the farm land from being developed, they have rejuvenated the existing orchards with over 5,000 dwarf and semi dwarf apple trees in our Pick-Your-Own Orchard. It’s a lovely farmstand; quaint but organized with a pretty healthy amount of items for sale. During our visit, the place was crowded and there was a buzz in the air. It sort of felt like those of us who knew about Beardsley’s enough to be there were part of a secret club of cool people. 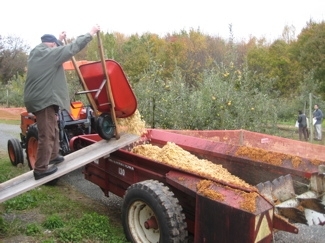 You can watch the workers dump freshly picked apples into the cider press and follow the process from beginning to end. And speaking of apples, these guys grow a ton of varieties for you to pick, so their cider is a perfect mix of tart and sweet. Our cider is 100% pure juice. We make it from sound, ripe apples that have blemishes, or are too small for selling by the bag. 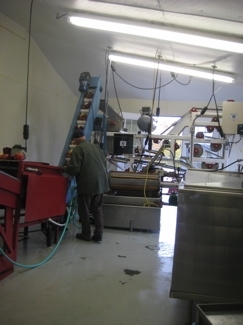 All cider apples are washed and scrubbed at least once, and most are washed twice before being ground and pressed. Our press is a state-of-the-art system with built-in high pressure washers to keep it clean and sanitary. At the end of each day of pressing we completely wash down the mill and sanitize the entire room. This is one of the reasons we think our cider tastes better. Our cider is not heat pasteurized but instead, is treated with Ultra Violet Light (UV). UV is used in the food industry to reduce pathogens that could potentially be present, but UV saves the fresh, apple flavor of the cider that is sometimes lost from heat pasteurization. Try it, you’ll taste the difference. We make it in small batches so it’s as fresh as possible. While they don’t make hard cider there, they’ll prepare for you what you need to make it at home. I’ve never heard of such a thing, but it’s pretty cool. 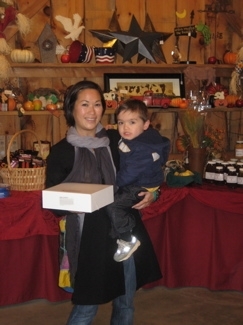 Beardsley’s Cider Mill opens for business on September 18th, and remains open until just before Christmas. 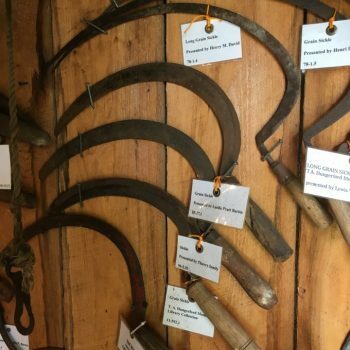 It’s a short season, but this farm in the White Hills of Shelton, Connecticut, is an apple-pie landmark. 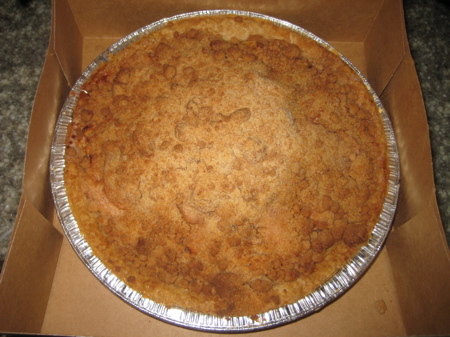 The minute you walk in the door, the aroma of baking pies is overwhelming. Ovens are located just to the right behind the register; and from them come some of the best apple pies we’ve ever eaten. Using only Northern Spies, the Beardsley family bakes traditional double-crusters and crumb-tops, plus apple-cranberry, peach, pumpkin, pecan, fruit ‘n’ berry and no-sugar apple. 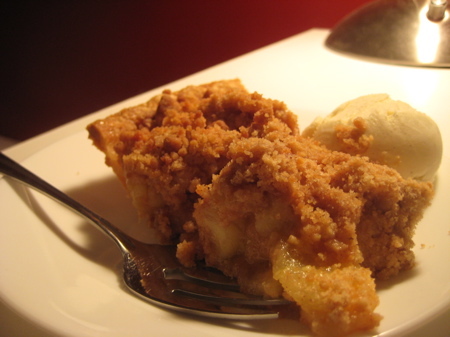 For us, it’s apple pie for sure; but still, it is a tough decision choosing between the crumb-top with its thick, sugary crunch and the two-crust pie with its surfeit of savory pastry, top and bottom. Then there are the apples themselves. Macouns, Red Delicious, and McIntosh grow in abundance. The farm also is home to trees that produce what the Beardsleys call “ugly apples” that happen to be rare and unique: Kingston Black, Tremlett’s Bitter, Brown Snout, Spitzenberg, etc. The latter are not always available; but it’s wonderful to know that this family cares enough to keep the heirlooms thriving. We eagerly opened it up later and I tore into it. Hm. It was certainly delicious but… but… I’ve had better. In fact, I’ve had better in this very house as well as my parents’ house. Yes, it’s true. 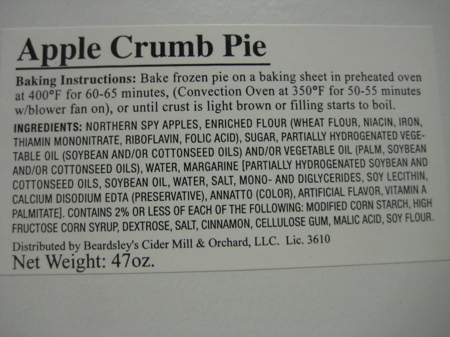 Don’t get me wrong, the pie was delicious; the crumb-top was perfect and the apples themselves were plump and had a firm texture. I think it was the filling that wasn’t “the best.” It was slightly gummy and tinny.